Never use anything toxic on the wooden pallet goat house as goats like to chew. 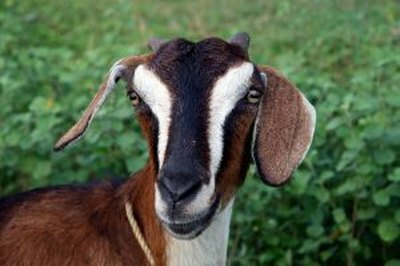 Keeping goats in your country backyard can not only provide you with entertaining and educational pets but also goat milk and the promise of delicious cheese as well. Goats need shelter, however, and sheds and barns can be pricey. Solve the problem by building a sturdy goat house with wood pallets. Stand two 4-by-4-foot wooden pallets upright so they meet at a right, 90-degree, angle at the corner. Use two large metal L-shaped brackets and screws to attach them to each other at the angle. Then attach a third 4-by-4-foot wooden pallet on the other side to make a square open-box shape. This wooden pallet structure will form the walls of the goat house. Stand another pair of the wooden pallets up so they meet at a right angle and use another pair of L-shaped metal brackets and screws to attach them together. This A-frame shape will form the the roof of the goat house. If you have access to smaller pallets, you may use them and a metal bracket that has a 45-degree angle instead of a right angle. This will result in a goat house with a more gently sloped roof. Cut the sheet of thin plywood into 4-foot-square pieces. Nail or screw these over the wooden pallets that form the roof of the goat house. Use rolled tarpaper, roofpaper or even shingles to cover this for increased waterproofing. A wooden or metal roof cap can be screwed over the very top to prevent water seeping between the two sheets of plywood. Cut a 2-by-4-inch wooden board just under 4 feet long. This should fit perfectly between the ends of the pallets on the open end of the open square box you previously built for the walls of the goat house. Screw this securely between the ends of the pallet near the top of the structure. This will add further stability to the walls of the goat house. You can also cover the walls with plywood sheets if you desire more airtight or watertight design. Lift the roof structure on top of the wall structure built with the three wooden pallets. Crawl inside and use large metal hinges and screws to attach the roof securely to the walls of the goat house. Hinges are very simple to use in this application since the angle of the roof meeting the walls is unusual. You can also use any metal bracket hardware you find that will fit the correct angle. Your wooden pallet goat house is now complete.